Credo Magazine interviews David VanDrunen on the historic Reformed doctrine of the two kingdoms. "What's the point of Calvinism? The very nature of Calvinism makes it unnecessary as a theology or doctrine. If every thing Calvin claims is true, what need is there to teach it or even argue over it? It matters not, one way or another, it is nullified." So...having a God-centered theology is pointless? Roger Olson begins a series of posts critiquing the book The Gospel as Center: Renewing Our Faith and Reforming Our Ministry Practices. His main complaint (as usual) seems to be that it's too Calvinistic. Terry Tiessen has completed a 12-part series reviewing Roger Olson's book Against Calvinism. Calvinism's "dangerous ideas" aren't unique to Calvinism. Like it or not, total depravity is a biblical doctrine. Michael Horton and Roger Olson join Ed Stetzer to discuss their respective books, For Calvinism and Against Calvinism. According to one "Bible teacher," Calvinism teaches that "God knowingly created most of His children to be lost." And here I always thought Calvinists believed that none of God's children would be lost. 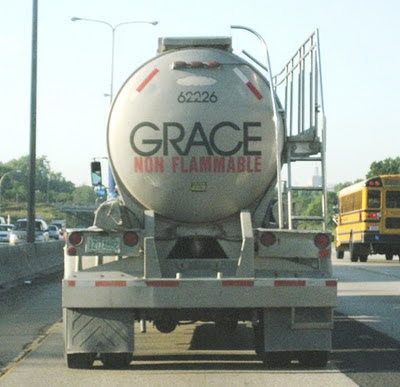 Do we Calvinists believe in salvation by faith alone? No, not really. Does Calvinism threaten the spread of the gospel? "No, Calvinism shouldn't hinder evangelism. If anything, it should give our witnessing great boldness with pure motives." John Piper asks, "Will we arrive blameless on the day of Christ?" Looking for a great comeback? 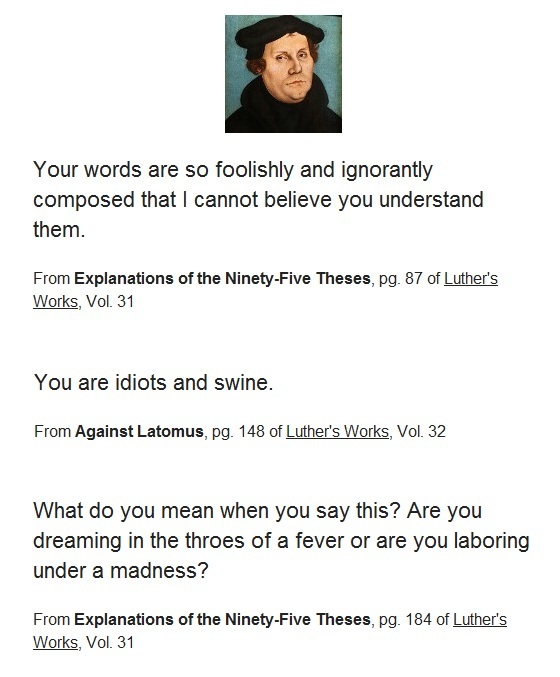 Check out the Luther Insult Generator.